Loma Mar was formed in 1997 after being invited to perform Haydn String quartets at Bard College in New York State. Equally at home in many musical genres, they have established a reputation for the broad stylistic range of their programs, from medieval to contemporary. 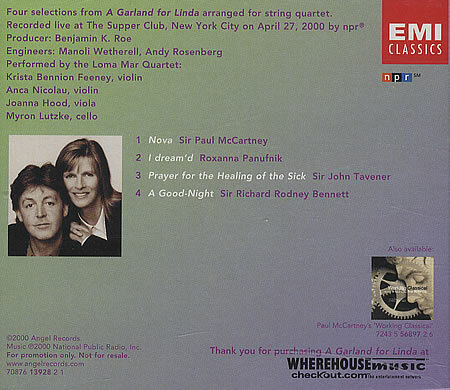 They worked with Paul McCartney in a recording for EMI, entitled Working Classical, that includes nine of his songs arranged for string quartet and two original compositions by Sir Paul written for the Loma Mar Quartet: Haymakers and Midwife. Shortly after the release of Working Classical, then at the top of the classical charts, the Loma Mar Quartet appeared with the London Symphony Orchestra in a live concert from Liverpool which has been broadcast worldwide. 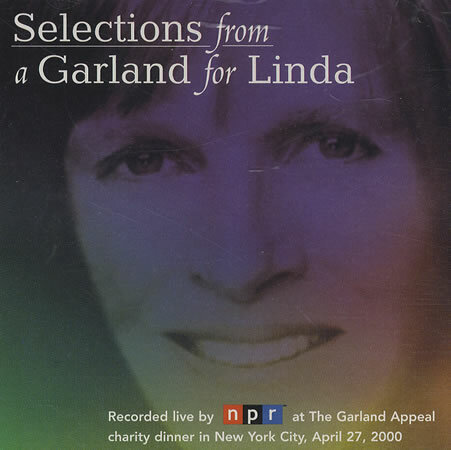 Continuing their eclectic career, in 2002 the Loma Mar Quartet recorded The Rhythm of Life with jazz singer Claudia Acuna, bassist Dave Holland and pianist/arranger Billy Childs. In 2008, the quartet with bassist John Feeney began the DNA project, or Dragonetti’s New Academy, and have since released two award-winning CDs of world premiere recordings of the chamber music of Domenico Dragonetti. Volume ll includes a recently discovered Joseph Haydn divertimento for two violins, cello and bass. Most recently, they were invited to perform Yesterday (solo quartet with singer and guitar) with composer/singer and guitarist Paul McCartney at the Library of Congress, the evening before President Obama presented Sir Paul with the Gershwin award. They are all either members and/or principal players of the Orchestra of St. Luke’s as well as internationally recognized soloists and chamber musicians. Indeed, the group came to Macca’s attention during the Standing Stone rehearsals I mentioned in the last post. But they were quite well known in classical circles, and they were familiar names on many a Performance Today broadcast. Check out the bios for violinist Krista Bennion Feeney, (concertmaster of the Orchestra of St. Luke’s and a regular violinist with the famously non-female-friendly Vienna Philharmonic), violist Johanna Hood (also a member of the Lafayette Quartet), as well as violinist Anca Nicolau and cellist Myron Lutzke of Smithsonian Chamber Players fame. The video at the top shows the quartet backing McCartney in the original George Martin arrangement of what is arguably the most covered song in history – and doing it on Strads, to boot. And below, you check out a little bit of their work on the “DNA Project.” Long live Loma Mar! 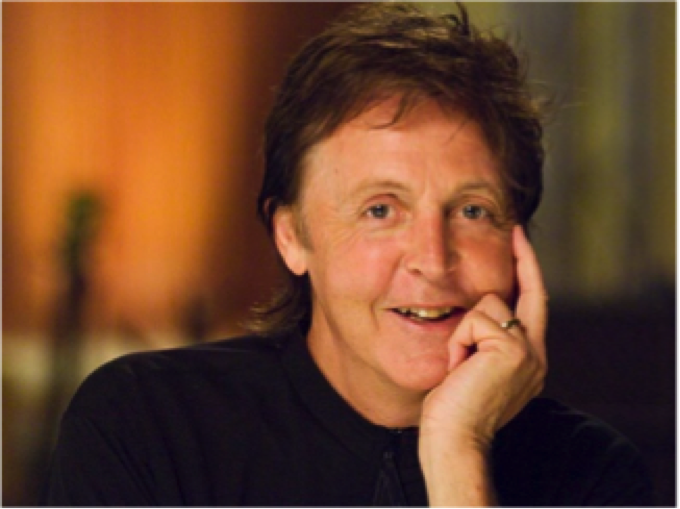 With all of the hoopla and remembrances this month about the 50th Anniversary of the “Beatles Invasion” of the US, I’ve been thinking about Paul McCartney’s post-Beatle, post-Wings, career as a budding classical composer. 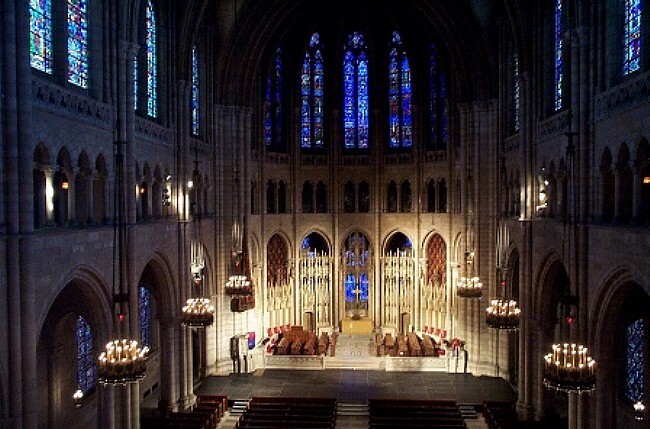 Which, it should be remembered, tended to veer towards choral works like the Liverpool Oratorio and the symphonic poem Standing Stone, featuring the Orchestra of St. Luke’s and New York Choral Artists. The American premiere of Standing Stone was my first brush with Beatlemania, when I produced the live broadcast from Carnegie Hall for NPR…which the Fleet Street-inspired PR folks for McCartney hyperbolically declared the live web/broadcast as “The Single Largest Classical Music Event in History.” (Remember, this was 1997, folks, when a “Web Cast” was a totally new phenomenon!). As it happened, Standing Stone turned out to be the first of many shows I produced for NPR involving McCartney. 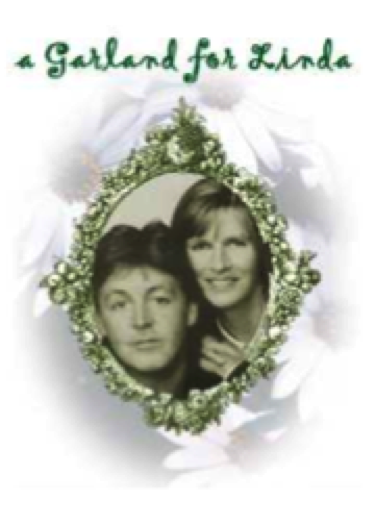 One of the most successful I think was another choral program: A Garland for Linda, a “choral song cycle” written as memorial for Linda McCartney/benefit for The Garland Appeal breast cancer research fund. The Garland was commissioned by the Arts Council of Great Britain, to celebrate the Coronation of Her Majesty Queen Elizabeth in 1953. One wonders if that ‘quango’ would be active in anything so ‘establishment’ in our age? The ten poets and ten composers were bidden to create settings for mixed voices. The idea was to craft a 20th century ‘replica’ of the famous The Triumphs of Oriana (1601) which was presented to Queen Elizabeth I. The present series of songs is not a parody of the earlier cycle but it is certainly influenced by it. The madrigal is a creative inspiration for both of these composite pieces. Don’t think it ever appeared on a recording. Peter was really the driving force behind the entire project, as I recall. Easily the longest article I’ve ever seen in Billboard, but absolutely riveting. Further proof that the Fab Four virtually invented the “modern” music industry (at least, pre-Interwebs). And, it must be said, rather humbling for us Cranky Old Farts who speak dismissively about the noisy music of the young ‘uns….to read how Jack Paar, Edwin Newman, Chet Huntely, etc. were so dismissive of that which they did not bother to understand gives you pause. Talk about lazy reporting. Then there’s the Sinatra-loving Capitol Records A & R man who turned down the “Dead in the Water” Beatles no fewer than FOUR times for US release…..oh yeah, and still kept his job! Read it and weep…. Well, actually, Vegas is not exactly my cup o’tea, but the Cirque Du Soleil show made it all worthwhile. It really is as brilliant as advertised – and superbly realized on a number of levels. (If you’ve just joined us, this story by Flo Rogers from KNPR in LV is a nice explainer about the George Martin/Giles Martin “mashup” of Beatles classics, commentary, and rarities that forms the soundtrack for the Vegas production.) Yes, the same George Martin who not incidentally is featured in the “History of Audio” mini-exhibit I mentioned the other day – producing the innovative (and long-forgotten) Marblehead Messenger LP by the early-70s fusion group Seatrain. Giles [Martin] and his father had free reign to use everything and anything ever committed to tape. That freedom came from the fact that the show grew out of George Harrison’s friendship with the founder of Cirque du Soleil, Guy Laliberte. The always protective, and sometimes litigious, Beatles’ company Apple Corp. was fully behind the project. I daresay Guy did George proud. b) Listening the score makes you appreciate George Martin’s musical sensibilities (a/k/a “the Fifth Beatle”) all over again, particularly his adept use of strings and tasteful (and downright innovative) orchestration and other instrumentation choices. I was really struck by how symphonic the weight and feel of the show is – you don’t hear a lot of early stuff, but you do get a lot of Martin’s most complex arrangements. And they really work. 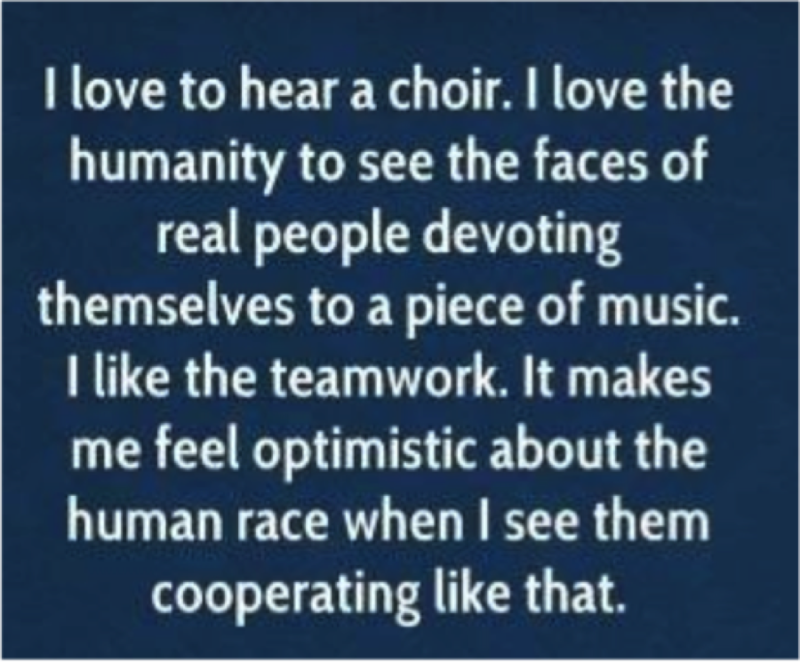 The Legendary Producer of the Beatles, Sir George Martin, shares his passion, Classical Music. Through warmly intimate, previously unreleased, video and liner notes, Sir George reveals his love of the sounds, as well as stunning details about the composers, and yes, even stories about his four famous “friends.” Sir George Martin has chosen vibrant recordings of the Royal Philharmonic Orchestra and assembled them into SIX enhanced CDs of essential collectible materials. c) Finally, a car-geek observation: there are a couple of guest appearances by some vintage (albeit tricked-out) VW Beetles in the show – and they’re both right-hand drive! Not a lot of those running around in Vegas – or in Montreal, for that matter! bottom line: Love. Worth a trip to Vegas. More than once.